This image shows James Buchanan, Lewis Cass, Stephen Douglas, and Franklin Pierce, all Democratic candidates for the 1856 presidential election, as united on the slavery issue. A giant "freesoiler" is tied to the "Democratic Platform" and his head is being held back by Buchanan and Cass. Douglas and Pierce are forcing a black man down the giant's throat. The platform on which his head rests is marked "Kansas," "Cuba," and "Central America," probably in reference to the Democrats' plans for slavery extension. In the background to the left a building is burning while a family flees, and to the right a man is hanging. 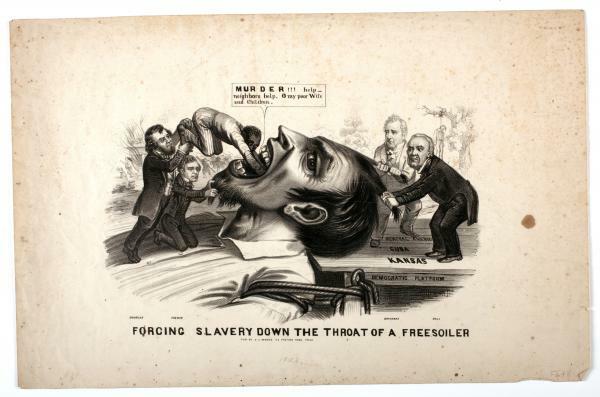 This image is in reaction to the violence against antislavery "freesoilers" in the wake of the Kansas-Nebraska Act.